As I sit here typing, the heartbeat of an ale is buh buh bubbling away in the fermentation refrigerator to my left. With every bubble, CO2 is released as sugars are broken down and converted to alcohol. This one will become a Belgian style Tripel, my 30th beer brewed. It's hard to imagine 30 beers, and to think I thought I was a decent brewer at beer # 6, 8, or even 14. Experience is sure to have an impact on the final product. My latest beers have turned out nice, and some of the higher gravity brews from earlier this year are starting to come of age. The English style Barleywine should go down nicely in the cold winter weather here in FL. It gets down to the 50s sometimes... brrr. If even freezes every now and then. I only wish it were that cool yesterday. I'm tired and still partially dehydrated from the hot afternoon brewday yesterday. 90 degrees, sunny, humid...a bottle of water for every two beers drank. Yeah, that will work well. It was the wort of the Tripel, of course, boiling away in the August heat here in Central Florida. I have a great plan for this beer too. But I'm getting ahead of myself. 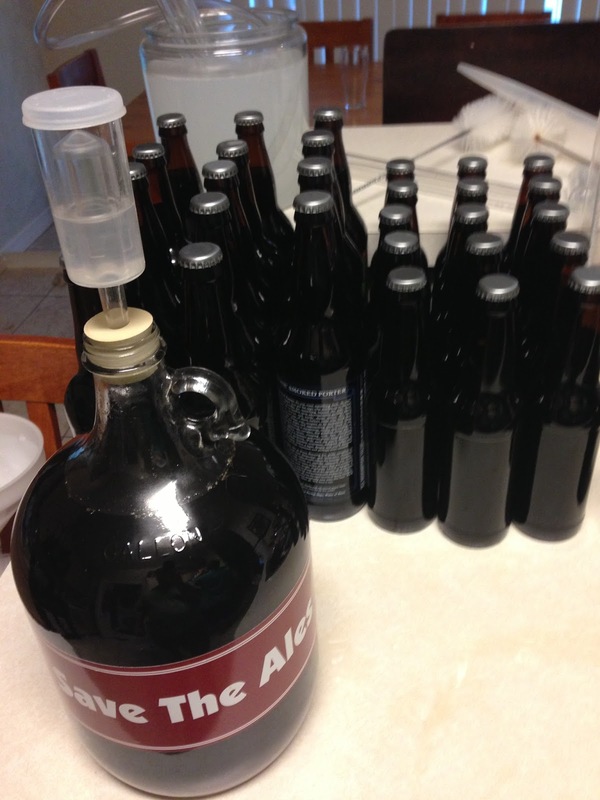 Let's back up to Friday night and go through a brief overview on the weekend of brewing activities. While in the bottling mood, with all the stuff everywhere, I decided to bottle up the single gallon of the Dubbel which had aged three additional weeks in the carboy with Bourbon soaked American Oak chips. Mmm, this one is nice tasting. 9 bottles in all, of this very limited edition beer. Time will benefit this one also, and after 4 weeks conditioning, I'll lager in the refrigerator for a couple of months. 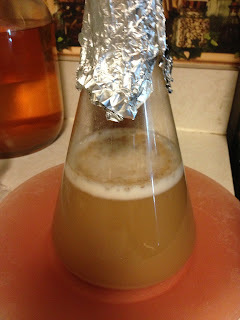 While working in the kitchen, I made the yeast starter for the Tripel. The next morning, activity was evident. Saturday was the group brew day, which means hauling all the equipment to brew off site. The difficulty level is elevated every time I travel to brew. It can get easier with practice, but there is something nice about the simplicity of doing it at home. In the end it worked out well and I had a good time.